The tongue-biter Cymothoa exigua is arguable one of the most (in)famous fish parasite in the world. It was famous enough to get a mention on the Colbert Report, and while the world recoil in collective horror at the sight of a fish which had its tongue replaced by a parasite, among its fellow parasitic crustaceans, tongue-biter's modus operandi is actually rather quaint. 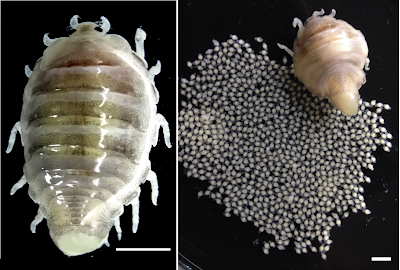 It can easily be upstaged by other parasitic isopods in the horror department, and today's post is about one those species. The parasite we are featuring today is Artystone trysibia - it is in the same taxonomic group as the tongue-biter (Cymothoidae), and it parasitises a number of freshwater fish in the Amazonian basin. But unlike its more famous cousin which is content with merely living in the host's mouth, A. trysibia cranks the nightmare fuel up to eleven and lives inside a fleshy capsule in the host's body cavity. This parasite and others like it are actually relatively common. This parasite has been documented from a range of freshwater fish from South America, and has also been reported from aquarium ornamental fish. They're so common that A. trysibia has gained a common name - "ghili" - among the Kichwa people. This study documented its presence in the Bristlemouth Armoured Catfish (Chaetostoma dermorhynchum). Despite its armouring, this fish has no protection against A. trysibia. Usually, the only sign of the parasite's presence is a small, gaping hole on their belly or their flank. But that hole serves as a window for the parasite within. For this study, these catfish were sampled from three pristine sites at the Tena River in the Amazonian region of Ecuador. These catfish are fairly small fish, and most of them are about 15 - 20 cm long (6-8 inches), but A. trysibia can grow to 1.5 - 3 cm (0.6-1.2 inches) long and takes up quite a lot of space within the catfish. For comparison, it would be the equivalent of having something the size of a pet rabbit living in your torso. 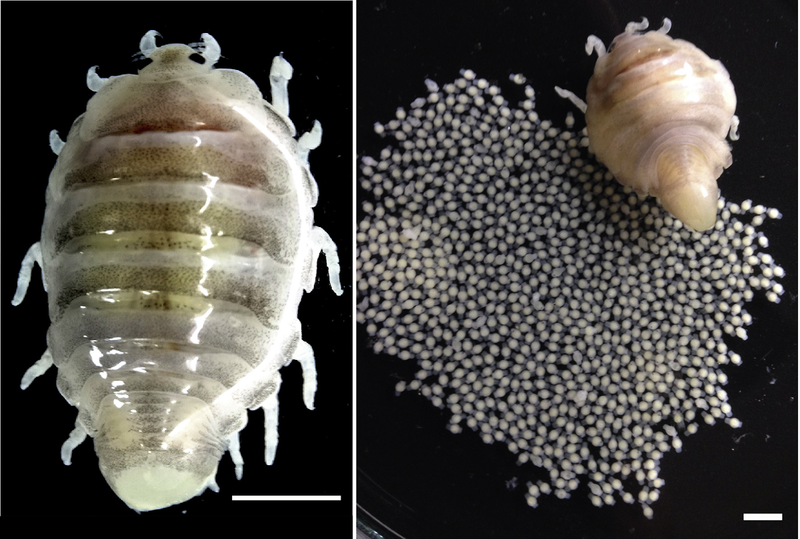 As mentioned above, the only contact the parasite has with the outside world is with a tiny hole through which they breath and release their offspring, and they can reproduce in prodigious numbers - one female isopod was recorded to be carrying 828 larvae. Each catfish was found to (thankfully?) only ever have a single A. trysibia, and it seems that the bigger the host, the bigger the parasite, possibly because a larger host would give the parasite more room to grow. Artystone trysibia is not alone in its style of parasitism, there are other similar species which are found in both freshwater and marine fish around the world (for example, see here). So the next fish which you come across might not just have a tongue-biter in its mouth, it might also have a ghili in its belly. Junoy, J. (2016). Parasitism of the isopod Artystone trysibia in the fish Chaetostoma dermorhynchum from the Tena River (Amazonian region, Ecuador). Acta Tropica 153, 36-45. Tunas are one of the most graceful animals of the sea. These sleek and powerful predators spend their lives in motion, cruising the open seas for prey. But despite being such formidable fast movers, this does not make them immune to parasitic burdens, indeed the parasite we are featuring today are found in the heart these pelagic predators. Scientists examining Pacific bluefin tuna (Thunnus orientalis) at a tuna ranch at the Wakayama prefecture, Japan came across some unfamiliar-looking flukes living in the heart of the tunas, which they described and named Cardicola orientalis in this study. Aside from feeding on the tuna's blood, the eggs that these parasites produce can become lodged in various tissues, obstructing blood vessels and causing harmful lesions and inflammations. In fact, these wayward eggs are more debilitating to the host than the adult parasite itself. If you think the fish host have it bad with these parasites, the invertebrate host have it much worse. These parasites have a complex lifecycle that alternates between a vertebrate and an invertebrate host. The adult parasite reproduce sexually in the fish host but the eggs that they produce (if it they don't get lodged in somewherein the host) are released into the environment and hatch into a larva call a miracidium that infects mollusc or polychaete worm (depending on the fluke species). Inside the invertebrate host, the fluke larva transforms into a sausage-shape stage call a sporocyst, which then multiply via cloning inside their body, turning them into a parasite factory (see photo above). This newly-commissioned biological factory then churn out another larval form of the parasite, called cercariae, which are shed into the surrounding waters where the fish hosts are found. So if you want to stop the tuna from getting infected with blood flukes like C. orientalis, you have to figure out which invertebrate is acting as the parasite factory in the fluke's lifecycle. Of the 136 known species of fish blood flukes, the full lifecycle is known for a handful of them. Because they are one of the few fluke species that can severely impair or even kill their fish host, fish blood flukes are a major concern to the aquaculture industry. Considering the number of marine invertebrates that can serve as potential host for C. orientalis, it would seem that these scientists had a pretty difficult task at hand. However, based on previously documented lifecycles for tuna blood flukes, they are somewhat different from those other fish blood flukes in that instead of using snail or a bivalve for their clonal stage, they use polychaete worms. Specifically they use a family of worm call the terebellids - also known as spaghetti worms - which live in burrows and crevices. The research team found many such worms encrusted on the structure of the tuna cage, alongside other invertebrates such as sponge, seashells, and sea squirts. The most abundant species was a marine worm call Nicolea gracilibranchis. They took monthly sample of these worms from the tuna cages from January to May, dissecting 4729 worms in total and finding 349 to be infected with the clonal stage of C. orientalis. Even though the researchers found that most of those worms were living on the floats that surround the tuna cages, it was the worms encrusted on the ropes which held the cage in place that are more likely to be infected with the parasite's clonal stages. 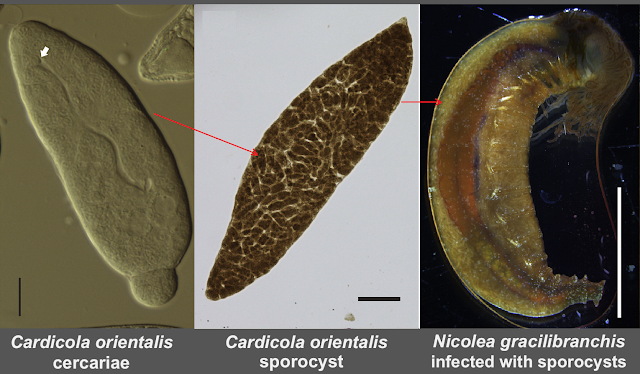 They also noted that infected hosts became more common over course of the sampling period, and while the worms they dissected in January were mostly filled with developing parasite embryos, those sampled after February were ripe with cercariae ready to pop. These pattern seems to indicate that the worms become infected through eggs that were expelled from tunas during winter and the parasite larvae developed over spring. Since tuna has a reputation for being a fast swimming fish, you'd think their parasites would be equally well-equipped for swimming. But instead, C. orientalis has a tiny stub of a tail which doesn't appear to be good for swimming (or much else for that matter). But somehow, they must be getting to the tuna just fine; either the infected spaghetti worms churn out so much cercariae that at least some manage to encounter their host, or they have some other adaptation that facilitates their rendezvous with a tuna. Or both. The research team also came across one case of a different tuna blood fluke species - Cardicola fosteri - which has previously been found in Australia and was featured in a post on this blog from 2011. It is worth noting that while in Australia, that parasite infects the worm Longicarpus modestus and the southern bluefin tuna (Thunnus maccoyii), in Japanese water they were infecting a different species of terebellid worm (Amphitrites sp.) and tuna for their lifecycle. So is this ability to switch host common to all fish blood flukes, or is it just this particular group of tuna blood flukes? This flexibility in host use would be an extremely useful adaptation, especially for a parasite like C. orientalis since its host is an open water animal which is widely distributed across the world's oceans. But this can also be a concern for fish farmers as fish species introduced for aquaculture may exchange parasites with wild fish native to a particular region. As the aquaculture industry incorporate more species to their stock, novel and/or poorly described species will emerge as new problems. The lesson here is that if you are going to farm fish, you better be prepared to come across some flukes. Shirakashi, S., Tani, K., Ishimaru, K., Shin, S. P., Honryo, T., & Ogawa, K. (2016). Discovery of intermediate hosts for two species of blood flukes Cardicola orientalis and Cardicola forsteri (Trematoda: Aporocotylidae) infecting Pacific bluefin tuna in Japan. Parasitology international 65: 128-136.